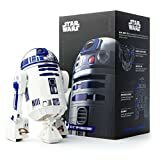 · Droid to Droid Experience: Let R2-D2 interact with other Star Wars App-Enabled Droids created by Sphero. · This R2 unit does not lack detail. Control your characteristic head turns, movements and sounds from your smartphone. It also leans over its unique retractable center leg and is able to shake, as in films. Complete the missions proposed by the app and become a real Jedi.